I am retired both from full-time work and from tournament bridge. My main bridge interest is researching the history of the tournament game in England: the first (and possibly only) instalment, covering the period up to the end of WW2, was published on the EBU website in December 2016. 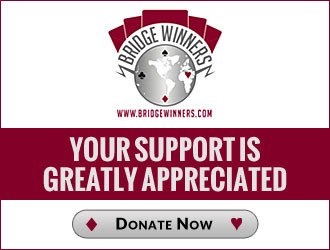 My first serious bridge partner was Richard Granville and he suggested that I sign up to this site. How do you play this 3♠ bid? What does this 3♥ bid mean? How do you play 5♥ in this sequence? What does this 4NT bid mean? Assuming that you play Leaping Michaels, is 4m forcing?